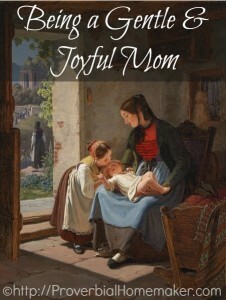 Do you struggle with anger as a mom? It is a common and oh-so-difficult situation that many of us go through, myself included. There is much to learn about a biblical view of anger. Of course, the first thing we need to do is turn to the Bible. What does God’s Word say? Are there scriptures to help overcome anger? This week in the Family Discipleship Facebook group, we started a book study on Pitchin’ a Fit: Overcoming Angry and Stressed-Out Parenting (New Leaf Press, 2016) by Israel and Brook Wayne. It’s not too late to join us, so grab a kindle version of the book and pop over to join us anytime! I’ve been really enjoying the chapters in this book and one thing that stood out to me was the set of scriptures that Israel and Brook referenced. Some of them are familiar to me in this context (dealing with anger as a parent) while others are not. For me, meditating on God’s Word and hiding it in my heart have been critical in my Christian walk. I admit, I haven’t prayed as much about this particular struggle in my life as I would like to. Thankfully, I can start now! 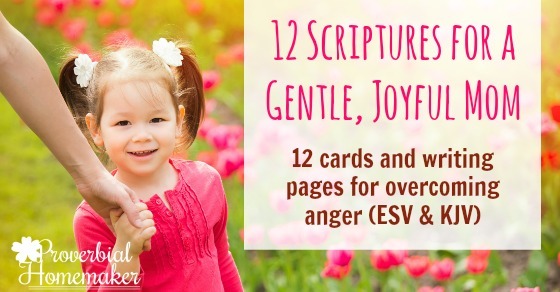 Today I’m sharing a simple set of scripture cards and journal pages for 12 scriptures to help overcome anger. Of course… It is the power of God and the transforming work of the Holy Spirit that truly overcomes anger. However, memorizing these scriptures, really thinking through what they mean in terms of our parenting, and praying through them, can be life-changing. So that is what I’m going to do. Will you join me? You can start anytime, with or without the use of the book. Simply work on one scripture a week. 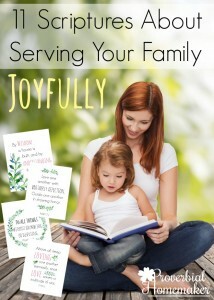 Print out the scripture cards for and journal pages (ESV and KJV included). I like to laminate the cards and put them on a book ring tacked to my wall. They are also sized 4×6 so you can slip them into a dollar store photo flip book for quick reference. Say the scripture every day, both aloud and to yourself. 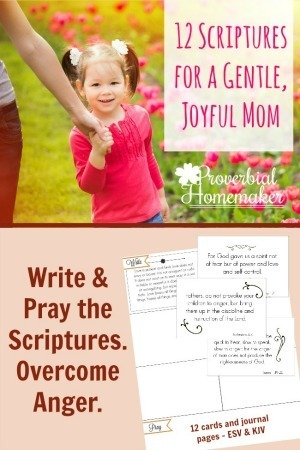 Then use the journal pages to write out the verses every day (at least 5 days each week) and then jot down notes or prayers in the bottom section. It’s simple, but powerful, and i am SO excited to get started! You might also be interested in our Anger vs. 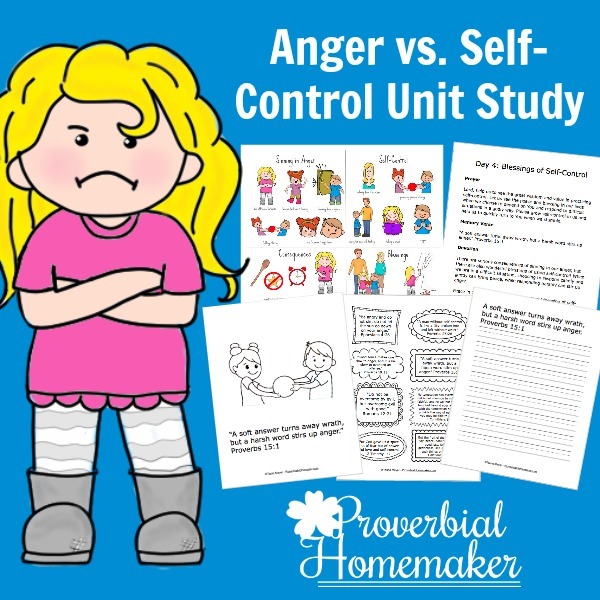 Self-Control unit study! As I said, some of the scriptures I included are ones I had not yet considered in this context. I plan to spend some time praying over and studying each scripture, but here are a few thoughts so far. 1 Corinthians 13:4-7 Love is patient and kind; love does not envy or boast; it is not arrogant 5 or rude. It does not insist on its own way; it is not irritable or resentful; it does not rejoice at wrongdoing, but rejoices with the truth. Love bears all things, believes all things, hopes all things, endures all things. This is one I’ve really needed to memorize. What a perfect scripture to run to in the heated moments. Just saying it out loud brings me back to God’s truth and calms me. Talking too soon and reacting is a big issue for me, I know, especially with my kids. The reminder that reacting harshly or thoughtlessly will not produce the effect I’m going for is a very good one I need often. I’ve come to learn that many times my anger and harsh reaction are a result of me trying to control things. Which usually stems from some kind of fear or selfishness. Fear that God won’t take care of my needs or give me everything I need to get the things done that I need to. Fear or embarrassment over my kids’ behavior or how it reflects on me, etc. But in Christ we do not have a spirit of fear, or anger, or selfishness, or irritability…. James 3:17-18 But the wisdom from above is first pure, then peaceable, gentle, open to reason, full of mercy and good fruits, impartial and sincere. And a harvest of righteousness is sown in peace by those who make peace. I need God’s wisdom (and not my own) to navigate the day and all the conflicts and sticky situations that come up. Every challenge is a chance to sow seeds of righteousness in a peaceful way. So important! How easily I forget. 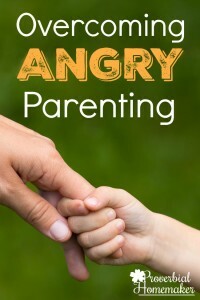 Provoking my children to anger with harsh words or unreasonable demands, or not setting clear expectations and then following through, is a sure recipe for frustration and discouragement all around. Again that reminder – am I responding to this situation with my child’s training and instruction in mind, considering their relationship with God and others? Or am I reacting because of the inconvenience it causes me, or taking it personally? I need a guard set over my mouth, and to take every thought captive to Christ, because so much of it isn’t truly good for building up and giving grace. Definitely praying over this one! When I start the day acknowledging that there WILL be conflicts and challenges, and consider how they can be used by God for His glory and for the sanctification of my and my children… it changes everything about my response in the moment. I just love the description of a “cool spirit” and being a [wo]man of understanding. I want that! Restraining my words is a big part of that. I want to have wisdom and self control to say the right thing at the right time. Only God can do that in me. Titus 2:11-12 For the grace of God has appeared, bringing salvation for all people, training us to renounce ungodliness and worldly passions, and to live self-controlled, upright, and godly lives in the present age. The grace of God that brought salvation in Jesus Christ is what teaches us in this area, dear women! Training us to surrender to Him and take on the righteousness of Christ for a self-controlled and godly life. To many of the negatives are a part of my life. Calling them out for what they are and calling out the attitudes that are of God help me a great deal. It’s like trading up, or taking off the old man and putting on the new. And this is where I ended because this is what we need! To live by the Spirit and allow the character of Christ to take over. I so needed this today! It’s been a rough week and I’ve felt my patience running thin. It’s been beautiful to see God take over and keep my emotions under control. There were times I knew I would have normally lost it or been petty and angry with my husband. I love seeing the work God is doing within me! The verse from James stood out to me. Ive always heard the “quick to listen, slow to speak and slow to anger” bit but the next part is often left out. “For the anger of man does not produce the righteouness of God.” Wow. Thank you for your post! I copied all these down on index cards and put them in my kitchen sink window, thank so much! Question: My family uses the NIV Bible for reading and memorizing. Would it be too much to offer your prayer cards and other scripture prints in NIV? Hi Marina! I would love to but NIV is under copyright so I would have to pay to do so. I currently pay to be able to use ESV for these resources. KJV is the only one I’m aware of that’s free to use. Sorry about that!